It’s commonly used in construction work as risers. It’s usually used to connect fireplaces to the riser duct. Remainder of the old duct. Examining the area between the ground floor slab and the exterior, we can see that all the area surrounding the old duct, made of brick and clay, was filled with smoke due to leakage. 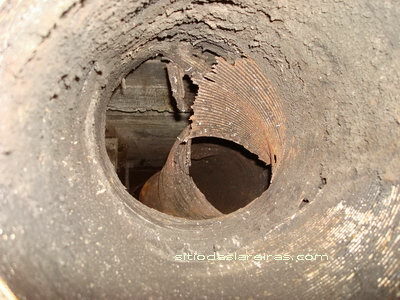 Remainder of the old duct, seen from above. We can see a power socket, which was set in the wall, already melted. View of the duct, smoke chamber and the interior of the hotte. a stainless duct throughout the whole system. Continuing flue duct in the first floor. 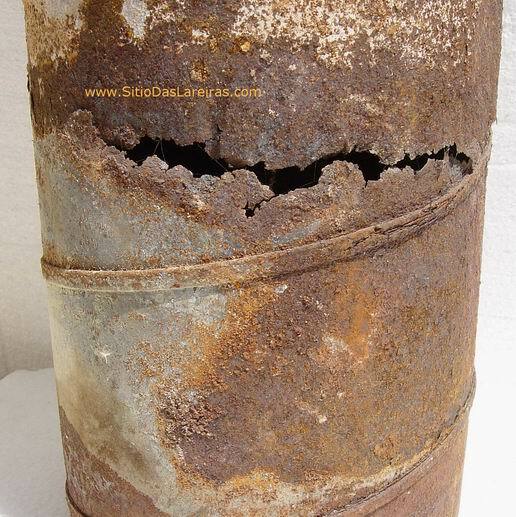 We can see the smoke leaking areas to the exterior of the old duct, made of brick and clay – a hazard for the room occupants where the flue duct passed. 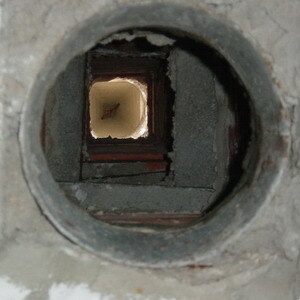 Detail of the chimney outlet, seen from bottom up. View from the top of the previous flue duct. Picture taken from bottom up. 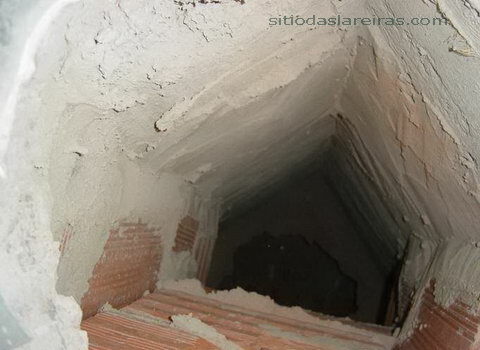 We can see the chimney concrete tube and verify that there’s a choking section in the chimney area. The fireplace had never been used. It’s commonplace, to find situations like this one, where it’s impossible to clean airway. 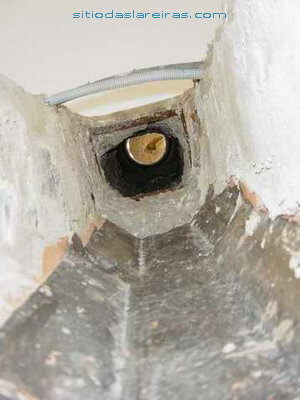 Here, we find a zinc steel pipe with a width of 20 cm, enclosed by a ceramic brick wall. 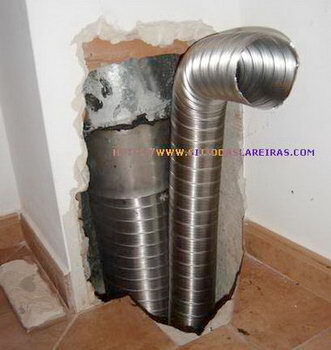 This type of duct doesn’t last long, it should have been installed a stainless duct; however, it’s best to have this duct than none at all. It’s good for cleaning while it lasts, and if it’s properly installed, it enables to slide a stainless duct inside it to connect to the stove. 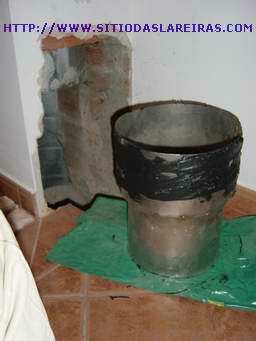 In this picture, an opening was made to allow the connection of the stove’s stainless duct to this existing duct. 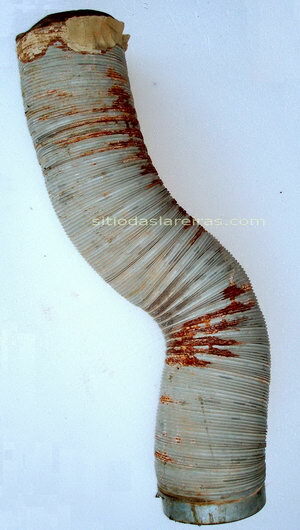 Detail of the stainless flue pipe and its connection to the picture duct. We used the opening to pass another duct to heat the room. 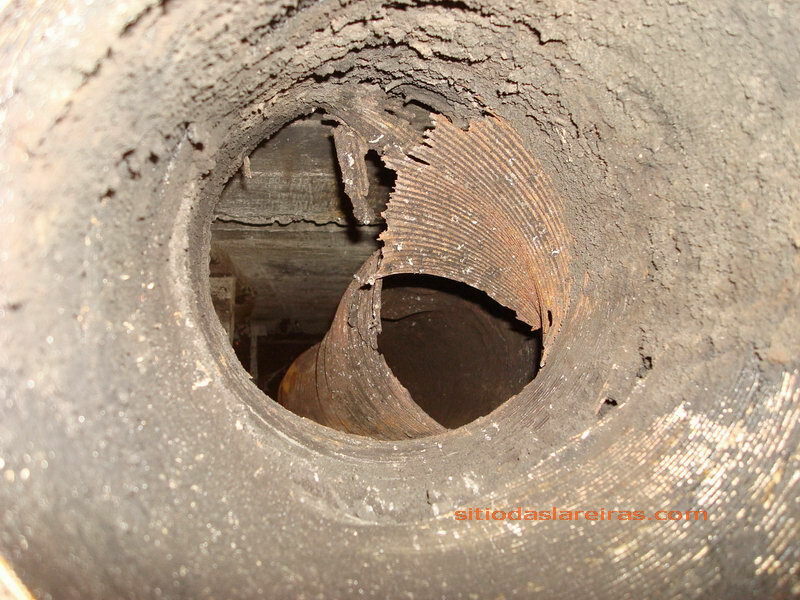 Flue pipe torn down as it let smoke leak into the upper room. We can also see the obstruction in the area where a beam crosses. 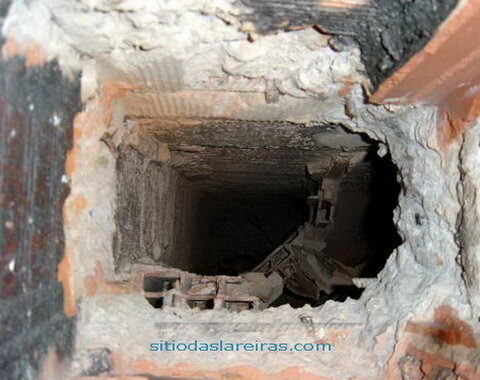 The beam should have never been drilled through to make way to a duct. 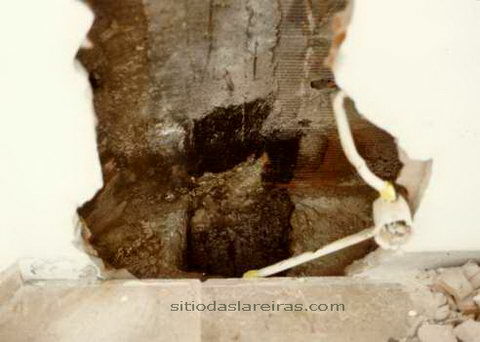 We can see two power cables near the duct, already slightly melted. 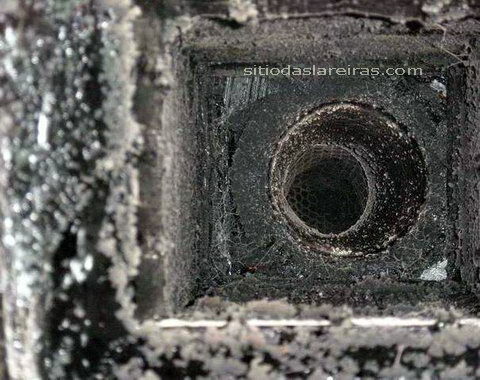 Flue duct of a stove which was poorly connected. We can see the smoke well outside the hood (hotte) area which was torn down. 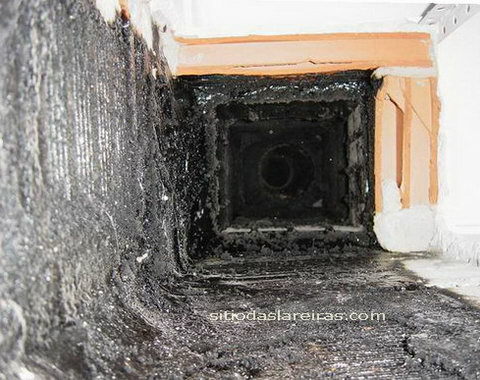 Sometimes, the connection to the fireplace floor is neglected, because the smoke in this area is in depression, but it isn’t always like that. 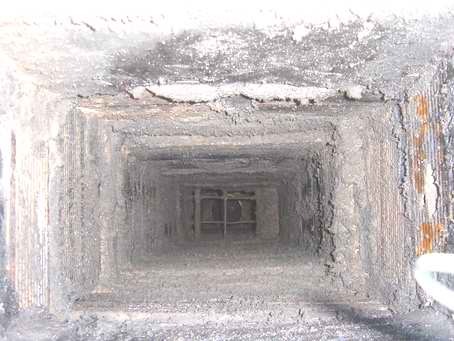 When there’s a choking in the upper part of the duct or chimney, the depression ceases to be, leaking smoke through the all the joints. 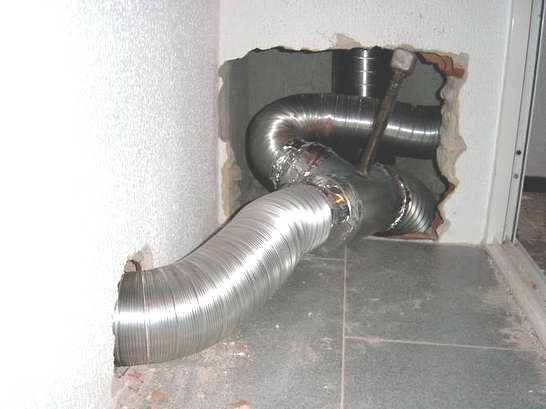 Stainless flue pipe already set by the building constructor, where he forgot to seal the passageway around the duct. In this instance, if the stove installer doesn’t properly seal the passageway, a great amount of the generated heat will leak through it. 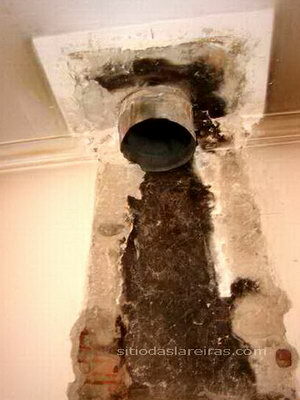 Alleged flue duct, without any duct. 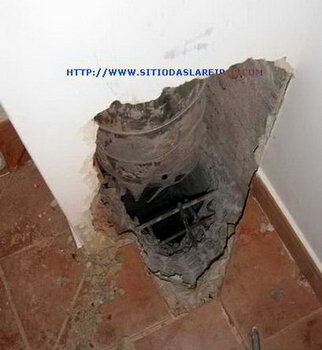 Problem: this time it wasn’t possible to insert a stainless duct to the top of the passageway due to the fact that the builder, mindlessly, forgot to cut the slab steal beams. 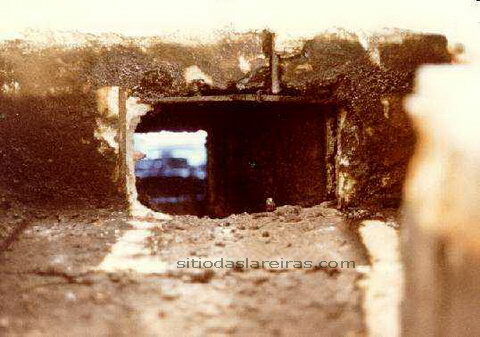 Solution: the cleaning of the passageway will have to be executed in two steps; through the interior of the stove, and through the top of the passageway, having been installed a removable chimney for that reason. You can see the smoke chamber covered in soot, even after the fire and explosion, in this open fireplace. 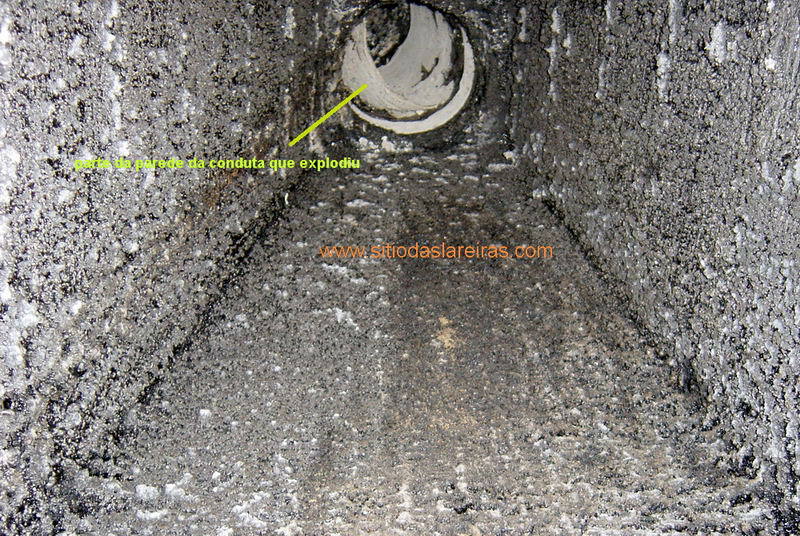 In the upper part of the duct you can see the beginning of fibre cement flue duct. 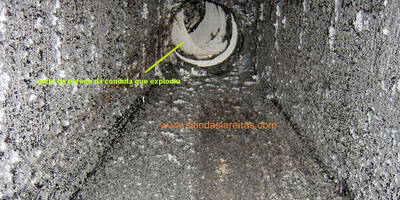 Reasons of the explosion: use of an inadequate duct and lack of its cleaning. 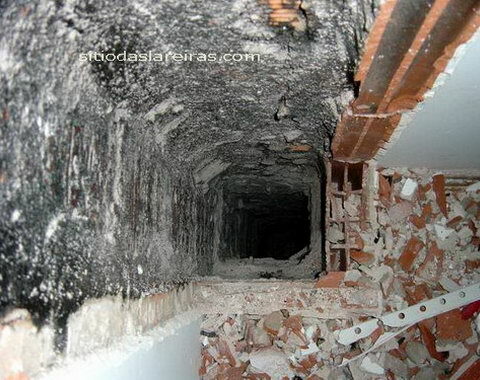 Problem: the fireplace wasn’t working properly due to the chimney, at the top of the passageway, being set on top of a prestressed beam, not allowing enough room for the smoke to go through. This type of error can only be detected after breaking an opening so we can insert a camera to check the interior. 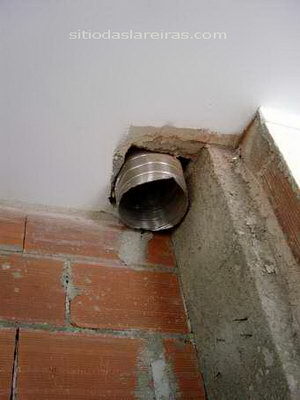 Solution: here, the flue pipe you see in the picture has 16 cm. As this duct size wasn’t appropriate for the existing stove, it had to be replaced by a new one. We took advantage of the large size of the passageway to insert heating tubes for the two upper rooms.